American magician Harry Lorayne is undoubtedly well known to members of this forum, and well respected for his expertise with playing cards and card magic. 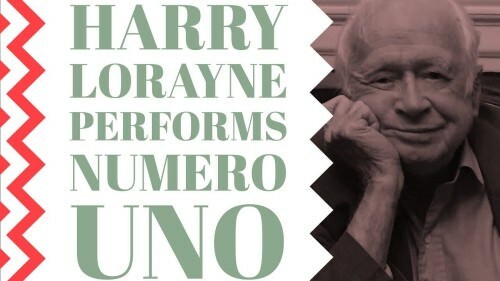 I have corresponded with Harry Lorayne several times in the past, and he always proved to be a real gentleman in answering my inquiries enthusiastically and at length. Given his extensive experience in the world of card magic across multiple decades, I thought that he would be the ideal person to ask some questions about playing cards, and get his thoughts. Particularly since he has the benefit of a long career in card magic, he is well placed to comment on how playing cards have changed over the years. So without further ado, I give you ... a living legend of magic, Mr Harry Lorayne! What kind of playing cards did you first use when you started magic? The cheapest deck I could find. Because that's the truth; I had no money - poorest kid on the block. (My parents were professional poor people!) I'd use the same deck for months - until sweat and dirt made it twice the normal thickness! Most of my young life, when I was using my own decks, and when I could afford it, Tally-Ho was the deck I always bought and used. Can you tell us the story about your first deck of playing cards? Wish I could remember the very first decks I used when I first got into card magic - at about age 11. I was the shyest kid ever - I mean to the point of sickness - too shy to raise my hand in school when needed to use the bathroom - you can see the end result there! 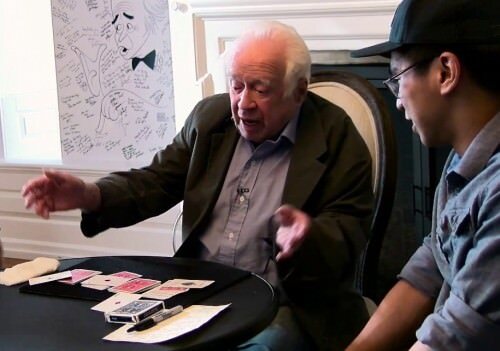 I saw a card trick when I was about 11 years old - and that changed my life. My thinking was, "Oh, if only I could do that!" I was too shy to ask the person to tell me how it was done - not realizing that he wouldn't tell me, anyway. I stole empty milk bottles from in front of apartments in the tenement in which I lived in the ghetto of the Lower East Side of Manhattan, NYC. Got two cents deposit each when brought to the grocery store. I needed 18 cents - which is what a deck of cards cost then - so that I could try to work out that trick I'd seen. Wish I could tell you the brand of that deck of cards - have no idea. Didn't matter to me at all. Anyway, I worked out a few methods for accomplishing the card trick I'd seen. One or two of the methods, I realized later, were better than the one I'd seen. Anyway, that started it all for me - that changed my life. It helped to take me out of that "cage of shyness" (yeah, I know - I've over-compensated!). In your early years, was there any reason for your choice of Tally-Ho decks? At the beginning, because money (which I had very little of) was more important than brand, I never thought of the "make" or brand of a deck - what I thought about was the "cost" of the deck. Cheapest is what I bought/used. I don't know - perhaps that was a good thing ... I paid no attention to the cards themselves, my attention was always on the effects or routines I wanted to do, and the presentation of same. Who knows? We're talking about 80/79/78... years ago --- maybe I made my choices and presentations of same according to the quality of the cards. Although I doubt it. What were those first Tally-Ho decks like, and how do they compare to the Bicycle decks produced today? How does the handling of modern decks compare with the handling of those decks you used when you started in magic? I honestly have no answer for this. I simply never paid any attention at all to the cards themselves when I started my "life in card magic." To me, "cards were cards." I do remember doing spreads, fans, etc., with any deck - well, with almost any deck. And most of the tricks that I learned/devised in those childhood years were automatically/naturally geared to the kinds of decks of cards I was accustomed to - at the time. I simply never thought otherwise - I guess 'cause I didn't know better! Which I also guess ended up being a good thing. What kind of playing cards did you use when you were performing? I haven't used my own deck when performing for a lay audience for three or more decades - I use only borrowed decks. Even when I was about 19 years old and doing table magic at Billy Reed's Little Club in NYC --- I did, of course, have to use my own deck when "working"/approaching tables there --- but when I was asked to appear at someone's party or gathering, when we made the arrangements - my fee, etc. - part of it was - I insisted that the person have two decks of cards there, one red backed the other blue backed. And - when I was introduced, he had to tell the audience that those where his decks, not mine. Did you ever use a custom deck of playing cards when performing magic? If you are using your own deck you sure don't want to use one with an unfamiliar (to your audience) back design. Current "custom" decks may be very good, but even if I did use my own decks when performing for laymen, I'd never use anything but a familiar brand - like Tally-Ho or Bicycle. Anything "unfamiliar" would smack of "trick deck" to the layman. In my opinion, how could it be otherwise when doing the kind of card "miracles" that I do and teach. I have my own deck when with other magicians - and I have decks that have accumulated in a drawer for a decade or two. People giving me decks, etc. So those are the ones I carry when I do carry - so I'm really entirely ignorant regarding current decks. Why was using borrowed decks for performing card magic so important to you? It's just plain obvious to me - you want to eliminate ANY thoughts in the minds of your audience members of a "not normal" deck. And the most definite way to do that is with THEIR deck. Why lose effectiveness when you don't have to? When I'd talk about using only borrowed decks to some magicians, at lectures, etc., I'd often get this sort of response - "No, no, it doesn't matter, because when I'm finished performing I give the deck to one of the people in my audience." And my response is - the truth - decades ago, when still using my own deck, I would do just that, and the response I usually got was - "Hey, I'm not a magician, I have no idea how to find the trick in this deck." So, for me anyway, giving someone the deck I used did not "solve the problem" of - "It's gotta' be a trick deck." Because that is the only "solution" the lay person could think of - or wanted to think of - they didn't want to believe that you could do some of the things you did with a "regular" deck - had to be a trick deck. The ONLY way to prove that you're using a regular deck is to use THEIR deck! Wouldn't borrowed decks sometimes handle poorly, and even make certain sleights difficult? Any deck "works" for me - there are just some things I don't do because of the condition of a deck that's handed to me. Not a problem - I sure have/know enough material so that it's okay to not perform certain things. Most of the "important to me" items of mine can be done with any deck. For example, I can open with my HaLo Aces using any deck, in any condition - and I usually follow up with anywhere up to four or five (sometimes more) four-ace effects that I can do with any borrowed deck. It changed my "repertoire" a bit. It is difficult, for example, to do a perfect faro with most borrowed decks. So, aside from the fact that currently my arthritic fingers make it difficult to do a perfect faro anyway, I mainly stopped using perfect faros because of borrowed-deck conditions. Not using my own deck makes it unnecessary to ever have a card signed. Not necessary to prove anything with a borrowed deck. And, can't use crimps - certainly not crimps that would "remain" in a card or cards. In either case, you can't or don’t want to do that with someone else's deck. What do you think are the essential qualities of a good deck of playing cards? The kind of decks I dislike mostly are those that do not have white margins - so I don't like Bee decks. Because any effect wherein one card is secretly reversed in the deck - a no-white-margin card would/could standout (when you didn't want it to) like a sore thumb. You couldn't spread or fan the deck face up (or even face down), etc. I've always felt that it's more important to give my attention to presentation than to worry about things like that. Although if I gotta', I gotta'. And, as I use as patter in one or two of my routines, cards are different in different parts of the world - different weights, textures, sizes, thicknesses, etc. My point is - that I never gave much thought to the "differences" - I just did what I always did, after handling the deck for a bit. The point, as I've mentioned, is the specific concentration on the performance/effect/routine, not the deck. Do you use playing cards for anything other than card magic? I've played cards with people who know me, close friends like Johnny Carson, Mel Brooks, Carl Reiner, Bob Fosse, Anne Bancroft, Stephen Sondheim, ex-mayor of NYC Mike Bloomberg, and on and on, but never with MY deck. And I'd always hear - "If you touch that deck we'll kill you!!" A huge thank you to Mr Harry Lorayne for kindly agreeing to do this interview, and to share these thoughts. He proves that it is possible to be successful with card magic with almost any deck of cards, and that what really counts is your skills in magic, and in his case, having a rare ability to entertain like few others. His perspective is also fascinating, because it highlights how magic is constantly evolving, and that is true of the playing cards used for card magic as well. Mr Lorayne had a personal love for impromptu magic with a borrowed deck of cards, and thus often had to make do with less than optimal quality. He also had to rise above the circumstances of a difficult and poor childhood, in which he had little option but to make the most of whatever cheap deck of cards he could get his hands on. In comparison, we live in a different time today, where most of us are spoiled for riches and for choice. Advances in technology and printing processes mean that the quality of playing cards is at an unparalleled level. Cards today are produced with embossed finishes and coatings that give them smooth and consistent handling like never before. The rapid rise of the custom playing card industry also means we are able to get our hands on creative and colourful playing cards that magicians of yesteryear could only dream about. The impact of crowdfunding is significant here, because it means that over the last half a dozen years, the production of playing cards is no longer limited to the big players in the industry, and as a result, the market is increasingly being flooded with custom playing cards, often at an affordable cost. The impact of all this on the magic profession is slowly becoming apparent. While previously there was an unwritten rule that using a non-standard deck of playing cards would arouse suspicion that it was a trick deck, that is no longer the case. As is evident from many online videos and trailers, it is becoming more acceptable and even normal for both professional and amateur magicians to use custom decks of playing cards for card magic. A deck of cards in the hand of a magician does have unique requirements, so the degree of customization cannot be too significant, because the cards must remain functional and easily recognizable. But the general public is becoming more accustomed to see a non-traditional deck used for card magic. All this is good news for everyone. It is good news for creators of custom playing cards, because they know there is a ready market waiting to buy their products. And it is good news for consumers of playing cards, which is most of us. We are living in an amazing time, where we have the luxury of being able to own and use a wide range of playing cards that handle superbly and look great at the same time. All that is left is for me to find a way to channel some of Mr Harry Lorayne's charisma and abilities with cards, and improve my own card magic! Tally-Ho playing cards were first introduced in 1885, are still produced by the United States Playing Card Company today, remaining a popular favourite for good reason. If you would like to use some of the same branded cards that Mr Harry Lorayne started with, and were his deck of choice for the early part of his magic career, check out the Tally-Ho range at PlayingCardDecks. Today these come in an assortment of colours and styles, although the two classic colours are red and blue, just like classical Bicycle Rider Back cards. Tally-Ho cards offer two choices of back design, the circle-back and the fan-back. I am not sure what is meant by "custom decks" but if it means those peculiar looking cards that are made nowadays that look like nothing on earth then it is an extremely daft idea to use them. I agree 100 percent with Harry about that. If you borrow cards and these daft cards are the only ones handed to you then fine and dandy but I think Harry Lorayne is the person I have ever heard of who is able to find opportunities to use borrowed playing cards in the first place. Not everyone can go to private homes and borrow cards. I personally dislike visiting private houses and even if I do then I can't expect the host to buy a deck of cards just for me since alas I do not happen to be world renowned like Harry. I do agree that using borrowed cards increases the effect of your work significantly but in the real world nobody carries decks of cards around with them (except magicians) so who the hell are you supposed to borrow them from? No-if you are performing impromptu on a regular basis you really have to carry your own deck with you and they should look as normal as possible. Let the people examine them if they think you are using a trick deck which they may well do (but who cares anyway?). After a while when they see you perform again and again on future occasions (which they will if you are any good) they will get to know you never use trick decks. Sooner or later someone will say "Here are my cards. Do it with these!" and if that happens then you can really go in for the kill. All my life I have read about doing magic with a borrowed deck but the books that tell you to do that never tell you how the hell you are supposed to borrow the deck in the first place. The answer is don't bother but if you get the chance then go ahead. I do agree that the results are better but sometimes you have to settle for second best otherwise you will never get to perform in the first place. Over the long run I have found using my own deck has never done me any harm and indeed has done me a lot of good. One tip though. If you have to use your own deck don't worry if they get old and grubby when you use them. The grubbier the better---it tends to assure your spectators that your cards are normal ones that you did not buy from the magic shop. If you are doing a formal show then your props should be spick and span. If you are performing impromptu for no money then you can do what the hell you like and they can like it or lump it. Great post Mark - thanks for sharing your thoughts and experiences!